Welcome to Part 2 of my take on the Brompton Factory Ride which took place yesterday. To any new readers welcome and to anyone who keeps coming back for more many thanks. The allotted hour came and the first group which included yours truly was allowed in. The comparison to the 'Golden Ticket' was quite apt as several fully grown adults, who should have known better walked past the Brompton sign and were out with their camera and phones happily taking pictures. A very patient and tolerant member of the Brompton staff who was our guide waited as we took pictures, perhaps slightly bemused. After all he works here and sees it every day. We on the other hand were seeing where all the magic takes place - some of the first time. I wager that pilgrims upon reaching Canterbury hundreds of years ago may have done the same, if they had of had cameras but they would not have had that look of crazed wonderment I detected in the eyes of the 25 Bromptonians who were about so see where their prized folding one was born. We walked in. The first thing I saw as I entered were several wooden boxes containing the brazed main frames of soon to be fully fledged Brompton bikes. They looked quite beautiful. Even though I had been on the Factory Ride last year the mystique of this location a powerful force. The factory has changed slightly only in terms of how the bikes are produced. Rather than building up a stock pile of parts ready to be assembled, they now more or less produce to order. This we were told has actually helped to speed up production. It was great to hear that Brompton is incredibly busy to the extent they are actively recruiting more brazers and have orders coming in copious amounts. The attention to detail and quality control is staggering. We were told that Brompton were focusing on quality control to an even greater extent. As this was being said my attention was drawn to the seat post parts, standing to attention on their best behaviour waiting for the time when they will be assembled. A brazer was working while we were there and provided a demonstration of this vital and highly skilled art. It was fascinating to see how the different components were placed in a jig and then brazed together. As someone who also has a Raw Lacquer Brompton, the brazing looks beautiful and shows off the skill of the brazers. The brazer showed us that his bikes are emblazoned with his X moniker. I thought to my Raw Lacquer bike and was convinced that I had an X on it but upon inspection at home I discovered that mine had a T. The brazer was very patient considering he was being bombarded with questions and photographed! One of the sights I found of particular interest were the Brompton bicycles packed up and ready to be shipped to their new owners. Each bike/box has a small piece of paper containing the customers details and what bikes and options they have chosen. Lots of these boxes were being shipped to the far east and many to South Korea. Brompton are an international and important exporter of significance. Of course anything orange caught my attention and the wooden boxes and shelves containing frame parts brought a smile to my face. The tour also showed all the different stages of a bikes assembly. All of the bikes that were in the processed of being built were the new H-type. The stainless cog wheel caught many peoples attention as it was different to the ones we all had on our bikes. There were shelves of black 2 speed bikes with Kojak tyres all bound for South Korea. I could imagine someone far away wondering when their bike is to be delivered. As for developments for the future Brompton is forever refining their bikes and components. There are plans for a slightly redesigned non-folding pedal. There also might be change in the bar grips. In addition the brake levers might be changed slightly. The joy of owning a Brompton is that on the most part any updates can be applied to an older bike. Of course things had to end and our tour was over. 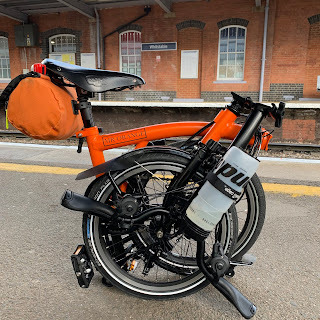 The danger of coming on the factory ride is that it makes me want to buy another Brompton or try and convince Mrs Orange Brompton that she needs one! I was thinking about colours and different options as I walked out of the factory. As we returned to the marquee we has a brief chat with the charming Will Butler-Adams, Brompton Chef Executive who along with his team has helped Brompton become a major exporter of bicycles for this country. He talked briefly about the toolkit that will be released soon. (Another thing I desperately want to own). Quite fittingly we later saw him making a good job of balancing on a board placed on top of a cylinder. Brompton bikes are serious commuting machines but they are also full of fun. A final photo opportunity beckoned as I shamelessly took pictures of my beloved Orange Brompton next to the Brompton signs before heading off to the train station. When I was on the train the days events raced past in a blur. An announcement that only folding bikes would be permitted on trains during the olympics brought a smile to my face and half the train carriage turned and smiled at me. I loved this event! Like a Haircut 100 song it brought a little feeling of sunshine to a rainy day. With a few weeks to the Brompton World Championships (which I will of course win) this event has really set me up for it. I hope that I am lucky enough to do it all again next year if Brompton decide to have another Factory Ride. I feel it is only fitting to thank Brompton for yet again putting on another well organised and fun day. I suspect this event must cost a great deal of money. Cynics out there would say it is merely a marketing tool. Well I am sure it is that but what other manufacturer of bicycles or cars for that matter does anything like this? Brompton riders are very loyal to the brand and knowing this I like to think Brompton are sharing the love. Now...what gearing should I get when I make an order for a 2013 model? Another good write up my buddy. helps me remember what an AWESOME day it was. You just missed mine! I placed my order in mid-April, finished assembly last Tuesday, and just TODAY it arrived at my "local" bike store (100 miles away). I'll have to see if Mr. X brazed my new Raw Lacquer P6R. This is such a treat, especially given my love for my own Brompton!